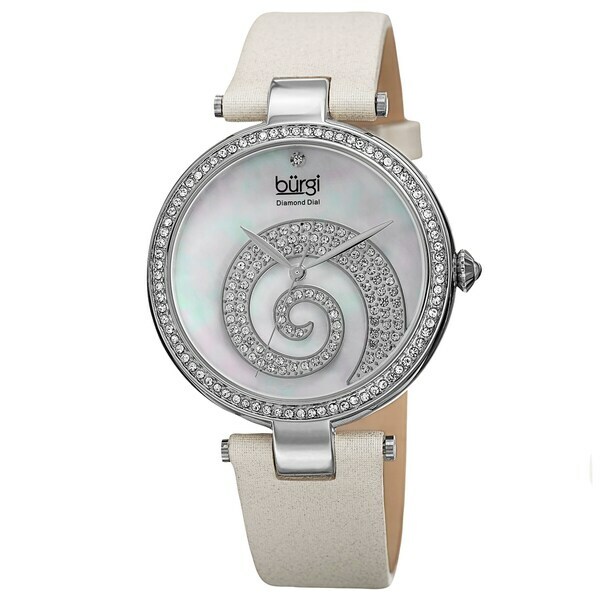 This fascinating women's timepiece by Burgi features a high polish alloy case construction and a T-bar style lug design. The MOP dial is decorated with an elegant swirl filled with genuine crystals and a genuine diamond set in the 12 o'clock position. Perfect for white nightmare before christmas watch. This is an absolutely beautiful and fun watch for a young lady I bought it as a gift for. I like that you can dress it up or down depending on outfits. My mom liked it so much that I have to order one for her as well! My wife absolutely loved this watch as one of her Christmas gifts. She has worn it once and has already received numerous compliments on it. The Tim Burtonesque spiral was the eye catcher here. I LOVE THIS WATCH. I FINALLY FOUND ME A WATCH THAT I CAN WEAR. IT'S NOT TO HEAVY AND IT'S VERY STYLISH TO WEAR. Really cool watch! Love it!!! I liked it. It thin, light weight and looks good. This watch is a show stopper - I play a lot of mahjongg and cards, so my hands are always center stage. My friends all wanted to try it on - they loved the 'bling'. GREAT buy for the price. This is a very pretty watch and my wife loves it. I got a great deal on it and couldn't have been more pleased. I would definitely reccomend this watch to anyone. Reviews sold me on it and its so pretty! DaVonna 14k Yellow Gold White Freshwater Pearl Pendant Necklace, 18"